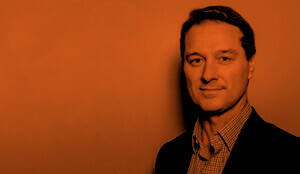 The tenth annual BetaShares/Investment Trends ETF Report provides a unique snapshot of the key statistics and drivers in the Australian Exchange Traded Fund (ETF) industry, from the perspective of self-directed investors, SMSFs and financial planners. The latest report shows the ETF industry is going from strength to strength, as record numbers of investors enter the Australian ETF market. The number of Australian investors using ETFs has grown to a record number of 385,000, up 22% from 314,000 the previous year. Investors holding ETFs through an SMSF increased to 120,000, up 15,000 from the previous year. That said, SMSF ETF investors as a percentage of the total ETF market declined from 33% in 2017 to 31% in 2018, reflecting a surge in the number of self-directed investors who are utilising ETFs outside of SMSFs (up by 52,000 from 2017). The average age of an ETF investor is 46 years, down from 51 years in 2013. 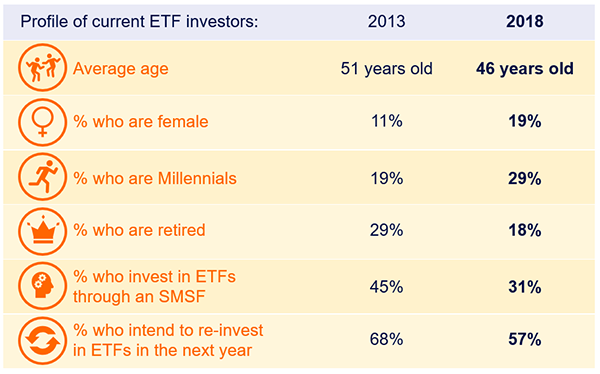 29% of ETF investors are millennials, compared to 19% five years ago. We believe that these trends will continue, and that younger investors in particular will be a big part of the ETF growth story in the future. Reflecting the increased use of ETFs by investors generally, financial advisers are adopting ETFs in increasing numbers. More than half of all advisers (53%) now recommend ETFs (up from 45% in 2017). A further 16% intend to use ETFs within the next year. 51% of financial advisers agreed that the use of ETFs has been of financial benefit to their clients, while 45% said that using ETFs had enabled them to service more clients. While financial adviser usage of ETFs is high, there is still significant potential to get more adviser involvement in the ETF market, with only 21% of investors saying a financial adviser was involved in their most recent decision to invest in ETFs. We believe that the Royal Commission could have a positive impact on the ETF industry, with financial advisers likely to favour lower cost, transparent products in recommendations to their clients. We saw an increased focus on responsible investing by ETF investors. 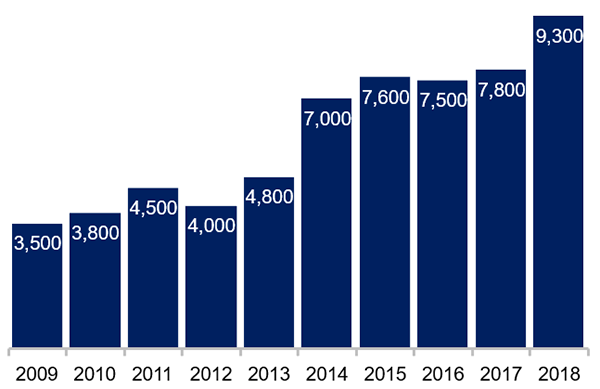 The market cap of ESG-oriented ETFs grew by a factor of 10 over the last four years, from $77 million in 2015 to $844 million in 2018. One in three ETF investors has already applied the concept of ESG in their investing over the last 12 months, while 25% of financial advisers have expressed interest in more education on socially responsible investing. We have certainly seen this interest in our own suite of products, with our two “Sustainability Leaders” ETFs, ASX codes ETHI and FAIR, receiving over $250m of inflows over the course of 2018. Source: ASX, BetaShares/Investment Trends ETF Report, 2019. As at 31 January 2019. Inflow data as at 31 December 2018. The Report projects a record 437,000 Australians will be invested in ETFs by September 2019. 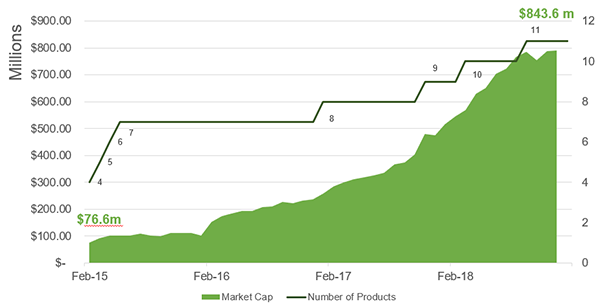 This year looks to be another exciting one for the ETF industry, and we expect the growth we are currently seeing to continue strongly. We project the Australian ETF industry could end 2019 with $50 – $55 billion in funds under management. Source: ASX, BetaShares. 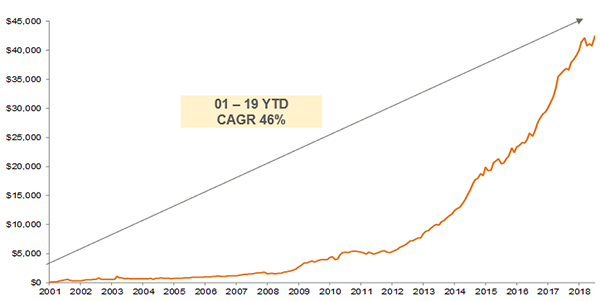 CAGR: Compound Annual Growth Rate. As well as expecting more Australians to join the ranks of ETF investors, we believe there is an opportunity to increase existing investors’ participation. More than half of all ETF investors rate their understanding of ETFs as average or lower, suggesting efforts to improve investor knowledge may prove rewarding. 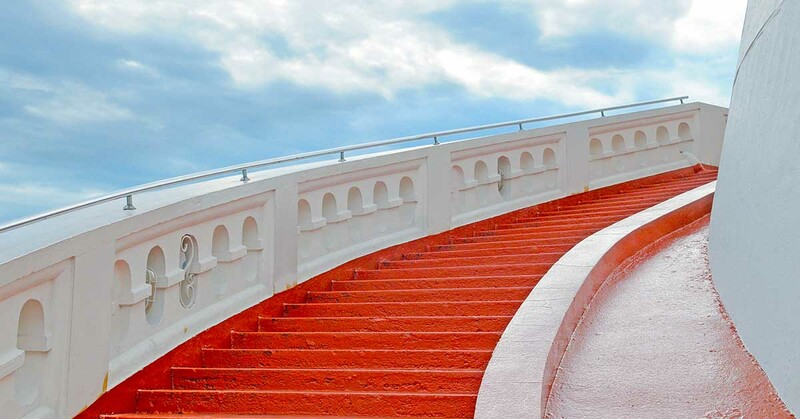 We believe that 2019 is likely to see increased adoption of ETF model portfolios, and greater interest in non-equity ETFs such as fixed income. If you’re interested in reading more – a summary copy of the Report can be requested here. Thanks for the enquiry. In terms of international equities our most popular in terms of flows have been BBUS, NDQ, ETHI and HACK. In terms of fixed income we have seen significant inflows into HBRD, CRED, AAA and QPON. We do not have information on the whole ETF market, so can not provide you with top ten flows overall. If you are referring to income produced by the fund then you will receive distributions periodically (monthly, quarterly, semi-annually). 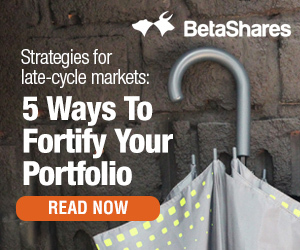 These will be distributed from the fund to your allocated account. If you are referring to capital gains then these will be recognised upon the sale of your units. You can sell ETF’s the same way that you purchase them, using either a brokerage site or a personal broker.